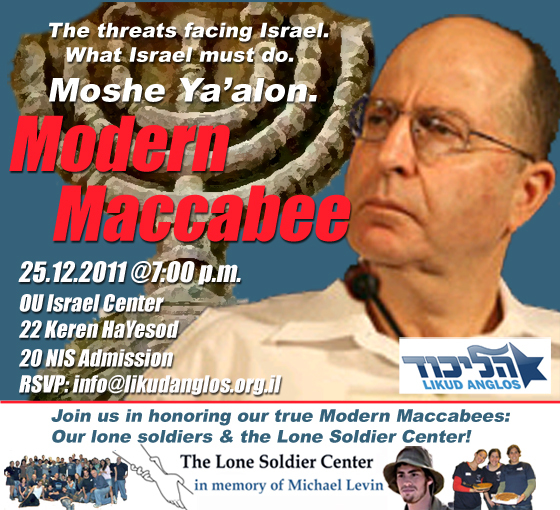 Join Likud Anglos this Hannukah in welcoming a modern-day Macabee, Moshe "Boogie" Ya'alon. Ya'alon is Vice Prime Minister, Minister of Strategic Affairs, and a member of the Prime Minister's "inner security cabinet." As IDF Chief of Staff, Ya'lon objected to the Disengagement Plan and his term as Chief of Staff was therefore not renewed. The Minister will address the security threats facing Israel and will take your questions. We will also be honoring Modern-Day Macabees --Lone soldiers. These olim who left their families and friends behind to serve in the IDF and defend the Jewish people. We will also be honoring the Michael Levine Lone Soldier Center for the work it does for our lone soldiers. If you know an oleh who served in the IDF and deserves an honorable mention please let us know by e-mailing info@likudanglos.org.il. Admission: 20 NIS (to cover costs). Discounts available to lone soldiers, students, and Likud members who RSVP. ***Please note that the Lone Soldier Center is not a sponsor of this event, but is being honored by Likud Anglos. The Center does not endorse or support any political party or movement. Moshe Ya'alon was born in 1950 in Kiryat Haim. He was drafted into the IDF in 1968 and served in the Nahal Brigade Paratroop Regiment. He served as a reserve paratrooper during the 1973 Yom Kippur War and participated in the liberation of the Suez Canal. He returned to active service after the war and completed officer's training. He held several command positions in the IDF Paratroop Brigade and commanded its reconnaissance unit during the 1978 Litani operation. He served in an elite unit between 1979-1982 and fought in Operation Peace for Galilee. He then rose to become deputy commander of the IDF Paratroop Brigade. Near the end of his term, he was wounded in Lebanon. In 1986, Ya'alon left to pursue advanced studies at the command and staff college in Camberly, England. When he returned to Israel, he became deputy commander of the elite unit in which he had previously served. In 1989-90, he retrained in the IDF Armored Corps and completed a BA in Political Science at the University of Haifa. In February 1990, he was appointed commander of the IDF Paratroop Brigade. In January 1992, he was appointed OC Judea and Samaria and promoted to the rank of brigadier-general. In August 1993, Ya'alon was appointed commander of the ground forces training facility at Tze'elim and commander of an armored division. In June 1995, he was appointed OC Intelligence and promoted to the rank of major-general. In May 1998, he was appointed OC Central Command. On September 15, 2000, he was appointed IDF Deputy Chief-of-Staff. On July 9, 2002, Moshe Ya'alon was promoted to the rank of Lieutenant-General and served as the 17th IDF Chief-of-Staff until June 1, 2005. In February 2009, he was elected to the 18th Knesset on the Likud list. In March 2009 he was appointed Vice Prime Minister and Minister of Strategic Affairs. Moshe Ya'alon is married and the father of three children. Source: Ministry of Foreign Affairs.